Whether you’re a designer, developer, business owner – or mixture of all three in the case of theme developers – the way you go about your business will almost certainly have altered dramatically over the last number of years. Trying to keep pace with the rate of change in WordPress and beyond can often feel like a full-time job in itself – witness the looming challenge of the WordPress REST API for example. One of the best ways of staying ahead of the curve is by examining the unorthodox success strategies of this generation’s new wave of billion dollar businesses. At the top of that particular tree in the WordPress world is, of course, Automattic. In this article we’ll look at six takeaways for theme developers from The Year Without Pants – the most in-depth, insider account of Matt Mullenweg’s company to date. What is the Year Without Pants? The Year Without Pants: WordPress.com and the future of work is an account of author Scott Berkun‘s time spent working as a team leader at Automattic from 2010 to 2012. And what better way to introduce the book than by its own ad? His 2013 book – which has garnered consistent praise since its release – is a backstage look at a company which has attracted attention for its often unorthodox approach to the nature of modern work. Berkun came on board as employee #58 at an interesting time for the company. At this time they were transitioning from a small, freewheeling team with no strict hierarchies, to a larger and more structured organization responsible for delivering value to millions of users. Though hired as a team lead, Berkun is also an accomplished author and speaker – as seen in his Google talk on the book below – with a long stint in various roles at Microsoft under his belt prior to joining Automattic. 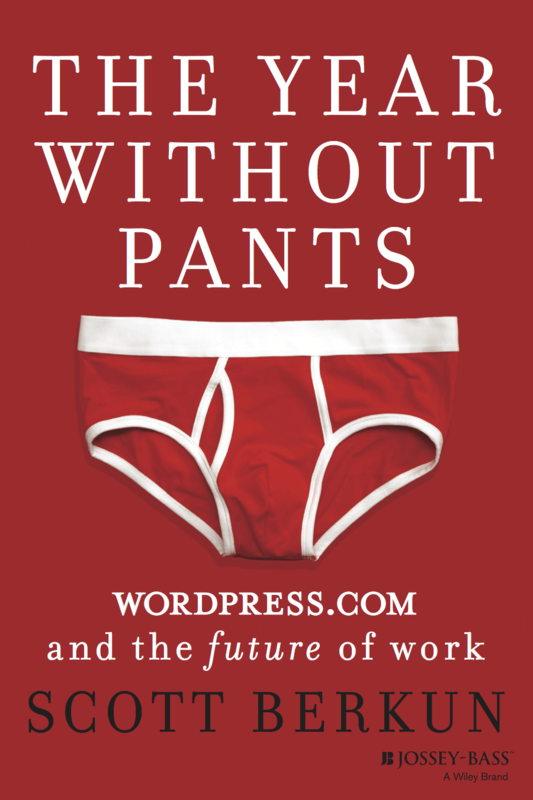 The Year Without Pants is both an account of Burken’s time working at Automattic and a fascinating insight into the changing nature of modern work, as seen through the eyes of an informed and deeply embedded observer. If you’re involved with WordPress in any professional capacity at all, it’s a fascinating peek behind the scenes of the biggest beast in the WordPress jungle. Furthermore, it’s packed full of actionable insights for theme developers in particular. Let’s look at some of the major takeaways from the book. Automattic has been a globally distributed company from its inception and – though they now boast modern headquarters in San Francisco – the majority of its workers are still operating remotely. One of the fascinating things about Berkun’s book is watching how this arrangement actually works in the context of the biggest WordPress project on earth. There really is no major obstacle to running a company of significant size remotely. Real world meetups still matter. Though juggling timezones and disparate remote schedules in his role as team lead is new to Berkun, the sheer amount of actual work covered by him and his team is testament to the fact that the setup fundamentally works. It may just be a manifestation of Burken’s background in more formal structures at Microsoft, but the importance of occasional real world meet-ups also shines through. Whether this is through the annual company meeting or the Athens team meetup – the first in Automattic’s history – that opens the book. 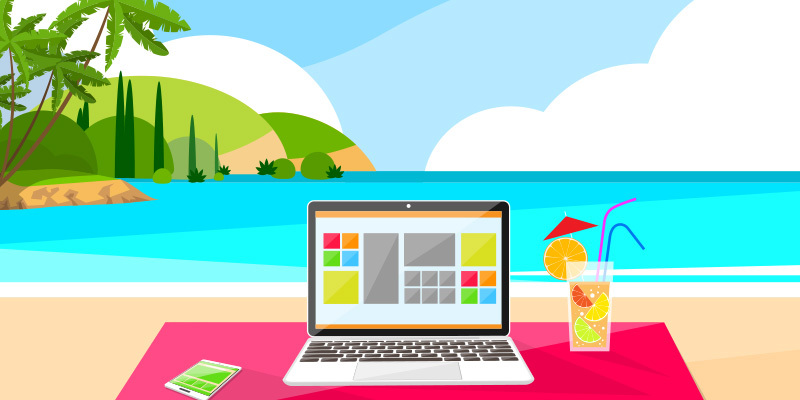 Theme developers worldwide can take inspiration from several aspects of the real world remote working environment that Berkun maps out for us. The author doesn’t shrink from describing negative aspects, and – whether concerning the availability of a global talent pool, approaches to geographically dispersed project communication or tips on management – there is a lot here to ponder. By the time I was hired in August 2010, there had been twenty-five thousand releases of WordPress.com, and there would be over fifty thousand by the time I left in 2012. Automattic’s success in delivering this rate of change is in large part due to the quality of their team. However the book also emphasizes their commitment to no-nonsense feature planning, and the best of modern development practices tie into this. Features are deliberately limited in scope and the various teams strive to avoid getting sucked into long, drawn out “big” releases. Instead they choose to constantly push small changes out the door while closely monitoring their impact and performance. As the book makes clear, this culture of constantly shipping is built upon a technical architecture of continuous deployment with the ability to release – and possibly roll back – multiple features on a daily basis. It’s a system that has been adopted by several other notable online heavyweights such as Facebook and Etsy, and is a fascinatingly iterative approach to product development that is genuinely new. A headfirst leap into continuous deployment may be a bridge too far for many theme developers, but there is much to be learned from the agile attitude, commitment to micro-release schedules and focus on feedback monitoring that Berkun describes. Another area where Automattic has attracted attention over the years is hiring, and Berkun’s account of his own initial on-boarding at the company offers an excellent illustration of their overall approach. Real-world trial projects – what Mullenweg refers to as hiring by audition – are heavily favored over abstract technical interviews or stunt questions; a strategy quite at odds with that of other tech giants such as Microsoft or Google. All new hires are also forced to complete a stint in customer support to learn the ropes which, while hardly a revolutionary approach, is an eminently sensible way of drilling the importance of the end-user experience into new hires. Automattic’s extraordinary success in building a billion dollar business with a comparatively tiny headcount leading to outsize revenue per employee figures shows the difference this type of approach to hiring can make. The main takeaway for theme developers – especially when hiring remotely – is clear: real world delivery trumps paper qualifications and claimed areas of expertise every time. One of the more remarkable insights that emerges throughout the book is that communication across a globally distributed team – responsible for satisfying millions of active users – can be managed almost entirely without email. Automattic have since added Slack somewhat into the mix, but it’s a set of figures that would still raise eyebrows at many companies. After a somewhat rocky start however, it seems to be one that both the author and his coworkers are incredibly productive with. A question many theme developers may be pondering after reading the book is whether they can follow the lead of the largest commercial company in their space, and look to minimize the use of email in their own businesses. A commitment to not over-complicating matters is on display throughout the book, but two simple lists leaped out in particular, both showcasing the incredible power of keeping things simple. Write a launch announcement and a support page. Consider what data will tell you that it works. As a near universally applicable set of steps for any business process, it’s hard to beat. Again, it’s a set of clear, actionable guidelines explained with a minimum of fuss. As most of our readers will know, theme development – and indeed working with WordPress in general – can be a complicated, multi-disciplinary business at times. One of the huge plus points of the book is the amount of practical, clearly stated guidelines and tips for keeping things simple that pop up throughout. Based largely on the consistently stellar growth statistics of WordPress.com over the years, Automattic has attracted several rounds of significant funding since its incorporation. It has also apparently been largely free from pressing daily financial concerns during its life to date. The company claims to be profitable since 2012 but what Berkun’s book makes clear – particularly in the chapter Show Me the Money – is that profit is not the driving short-term motive at the company. The focus instead seems to be consistently on culture, product development, user experience and the company’s stated aim of democratizing publishing. While the average theme developer may not be afforded the luxury of venture capital funding anytime in the near future, there is much to be learned from the idea of concentrating on long-term, user-focused growth and not betting the farm exclusively on the pursuit of short-term profits. The Year Without Pants has insights worth pondering in every chapter but it’s far from the only business book worth adding to your reading list. Getting Real from the team behind Basecamp: Though billed as a guide to building web applications more effectively, this (free) eBook also functions as an insider guide to many modern work practices and dovetails nicely with themes explored in Berkun’s book. Follow-up titles Rework and Remote are also recommended. The Smartest Guys in the Room by Bethany McLean and Peter Elkind: One to be filed under cautionary tales, this searing account of the fall of Enron shows the critical importance of culture and core values in companies of any size. The Year Without Pants is highly recommended for anybody in the WordPress space. The engagingly written tour through a year in the life of WordPress’ largest commercial entity is consistently insightful and – while the six points we’ve highlighted are general – you’ll find specific takeaways as a theme developer scattered through every chapter. We’d love to know if you’ve picked up a copy of the book yet, or if you have any other titles you’d recommend to fellow WordPress professionals. Get in touch in the comments below and share your thoughts. I’ve added this to my wishlist on amazon :) thanks for your review.